OB Press and RIT Cary Graphic Arts Press, Rochester, New York, USA, 2016. In English. 80 pp., unillustrated, 6¼x9x½". Teaching Photography, Notes Assembled is a slim, unassuming book that has been an unexpected hit in photography circles. This expanded edition features an additional chapter and is co-published by OB Press and RIT Cary Graphic Arts Press, both affiliated with Rochester Institute of Technology. In Teaching Photography, Perkis draws from four decades of teaching experience at such institutions as Pratt Institute, and Cooper Union, as well as School of Visual Arts in New York. He has distilled his knowledge into this volume of thoughts on visual perception, successful photo lesson exercises, and practical teaching advice for photography instructors. 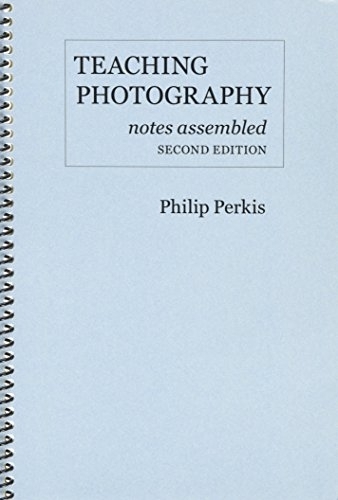 Perkis expresses his acute observations as a means of provoking discussion and inspiring the younger generation of photography students and educators. Carefully typeset with ample margins and devoid of photographic images, the reader is encouraged to exercise the mind's capacity to visualize — a vital tool for the art of making photographs. Philip Perkis attended the San Francisco Art Institute and studied with Ansel Adams, Dorothea Lange, and John Collier, Jr. He served as chair of photography at Pratt Institute and is currently on the graduate faculty for the School of Visual Arts and Tisch School of the Arts, NYU. Perkis's work is represented in many museum collections, including: George Eastman House, The Getty Museum, Metropolitan Museum of Art, NY MoMA, and SF MoMA.